We are Tip Top Meat, a meat supplier that offers high quality meats as well as an on-time delivery service. As leading meat suppliers in South Africa, we guarantee the quality of our meat. What’s more, we have meat delivery and customer service to match. We choose to give you, the Customer, our never-ending commitment. This applies whether you buy meat online, in-store, or through our sales representatives. We constantly improve on our service, quality, and consistency, whether buying meat online or otherwise. Thus, we have sales representatives at the ready, giving you professional product help. We also have a trained team of telesales ladies. They are just a phone-call away, ready to help you with orders and pricing. At Tip Top, we have a dedicated team of dispatch personnel. Their task is to check, load, and deliver your products on time. Their dedication cements our reputation as a reliable meat supplier. And, in fact, one of the best meat suppliers in South Africa. We source our meat from the best possible feed lots and abattoirs. Thus, buying meat online or through our telesales will ensure quality. These are readily available to us, and include reliable spice and packaging companies. Your quality meats will come from such reputable names as Freddy Hirsch and Crown National. This ensures that the customer receives the best product available. We have certified approval from the Department of Agriculture, Forestry, and Fisheries. This acknowledges that we follow current requirements for exports to all African countries. Thus, recipients of our meat delivery can rest assured of an ethical, compliant, high quality product. This applies when you buy meat online or through another method with us. Tip Top Meat has been in business for the last 30 years. Our track record speaks volumes towards our reputation as a meat supplier. We assure you that our products will not change. We commit ourselves to cost-efficiency without compromising on quality. The same applies when buying meat online with us. Our clients can expect the best from products that carry our name. This is because our original recipes do not change. If you’d like to pick our bones over pricing, it is only due to their sheer quality. What’s more, as leading meat suppliers in South Africa, we value consistency in excellent service. Quality meats you buy today will surely arrive tomorrow. We know this is what you need from a Tip Top Quality meat supplier! We have our own delivery fleet which deliver our products to Mines, Restaurants, Hotels, Schools as well as Catering Hospitality groups. 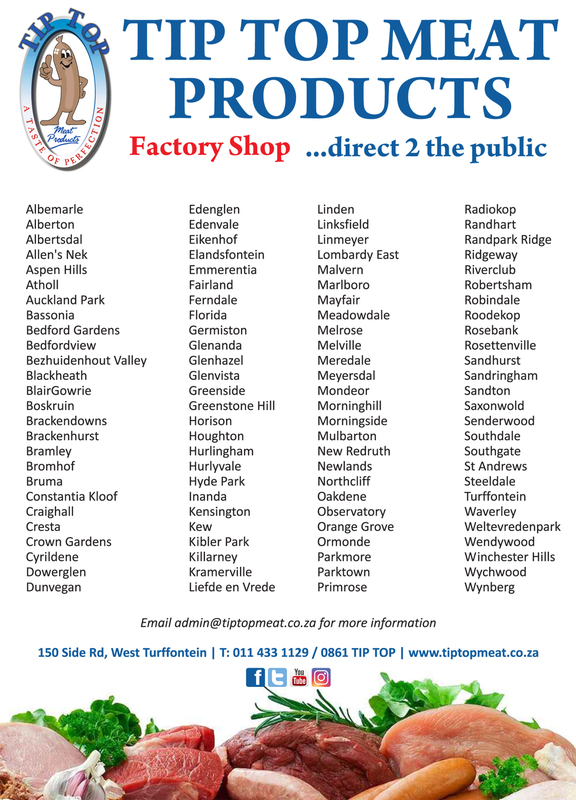 We deliver in the North as far as Thohoyandou, Louis Trichardt, in the East; Nelspruit and Hazeyview and to the West, Upington, Kuruman, Klerksdorp, Ventersdorp, Potchefstroom and Vryberg. down South we deliver to Welkom, Bloemfontein and Kimberly as well as neighbouring countries, Mozambique, Zambia, Swaziland and Lesotho. Above all, our highest priority is you, the customer. Buying meat online through us is a choice you won’t regret. We provide customers with a consistently excellent range of high quality meat. You’ll keep coming back for more! That is our promise as meat suppliers. If you would like to find out more about Tip Top Meat, please contact us!